was born in 1978 in Tehran, Iran, and started playing traditional Persian music very early on. 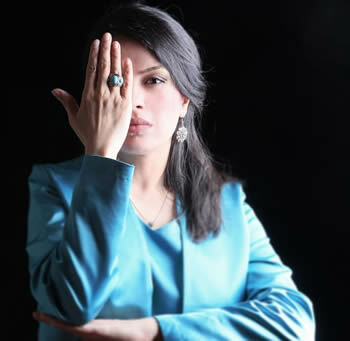 she is a graduate of Tehran Conservatory where she mastered playing Tar and Setar (traditional Persian instruments) under the instructions of master Fariborz Azizi. She further enhanced her performance of the renowned capabilities by enjoying the direct guidance of the renowned master of traditional Persian music, Hossein alizadeh, and the respected music theoretician, Dr Mehran Rouhani. She continued her formal music studies in composition at St Petersburgh Conservatory, Russia. she also attended the R.G.S University, Turkey, for a comparative study of Persian and Turkish music. Sahba was awarded and recognized as the best Tar player by the Iranian Music Festival for four years in a row, from 1995 to 1998. In 2000 she joined the Iranian National Orchestra and since then she has been traveling around the world to present Persian music. Sahba has recorded several CDs and composed numerous theatrical peaces. Currently she is a resident of Southern California where she spends most of her time teaching Tar and Setar to her students. She graduated from California institute of the arts with a BFA in World music performance and dance major. has been playing the Tar under the supervision of Iranian Music Maestro Virtuosi Mansour Nariman since 1987 and under supervision of Iranian Music Maestero Mohammadreza Ebrahimi since 1997.